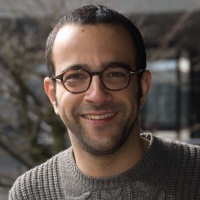 Dr. Ufuk Olgac joined the Interface Group at the Institute of Physiology in University of Zurich as a post-doctoral researcher in September 2012. His main research interest is in the computational modeling of flow and transport related phenomena in physiology. He was previously a post-doctoral researcher in Koc University in Istanbul, under the guidance of Prof. Dr. Metin Muradoglu, working on computational biofluid dynamics of the respiratory system. Before, he was a research & teaching assistant at the Laboratory of Thermodynamics in Emerging Technologies at ETH Zurich, where he completed his Ph.D under the supervision of Prof. Dr. Dimos Poulikakos. His doctoral research dealt with the modeling of low-density lipoprotein (LDL) transport in human coronary arteries and its association with blood flow characteristics. He completed his masters and bachelors degrees, both in mechanical engineering, at Koc University in Istanbul and Middle East Technical University in Ankara, respectively. Upon completion of his post-doctoral research at the Interface Group, he moved towards the industry. Olgac U, Muradoglu M. Computational modeling of unsteady surfactant-laden liquid plug propagation in neonatal airways, Phys. Fluids 25, 071901 (2013). Olgac U, Izbassarov D, Muradoglu M. Direct numerical simulation of an oscillating droplet in partial contact with a substrate, Computers & Fluids, 77 (2013), 152-158. Olgac U, Muradoglu M. Effects of Surfactant on Liquid Film Thickness in the Bretherton Problem, International Journal of Multiphase Flows, 48 (2013), 58-70. Rikhtegar F, Knight JA, Olgac U, Saur SC, Poulikakos D, Marshall W, Cattin PC, Alkadhi H and Kurtcuoglu V. Choosing the optimal wall shear parameter for the prediction of plaque location – A patient-specific computational study in human left coronary arteries, Atherosclerosis, 221 (2012), 432-437. Olgac U, Knight J, Poulikakos D, Saur SC, Alkadhi H, Desbiolles LM, Cattin P, Kurtcuoglu V. Computed high concentrations of low-density lipoprotein correlate with plaque locations in human coronary arteries, Journal of Biomechanics, 44 (2011), 2466-2471. Knight J, Olgac U, Saur SC, Poulikakos D, Marshall W, Cattin PC, Alkadhi H and Kurtcuoglu V. Choosing the optimal wall shear parameter for the prediction of plaque location – A patient-specific computational study in human right coronary arteries, Atherosclerosis, 2010 Aug; 211(2):445-50. Olgac U, Poulikakos D, Saur SC, Alkadhi H and Kurtcuoglu V. Patient-specific three-dimensional simulation of LDL accumulation in a human left coronary artery in its healthy and atherosclerotic states, American Journal of Physiology-Heart and Circulatory Physiology, 296: H1969-1982, 2009. Boutsianis E, Guala M, Olgac U, Wildermuth S, Hoyer K, Ventikos Y, and Poulikakos D. CFD and PTV steady flow investigation in an anatomically accurate abdominal aortic aneurysm. ASME Journal of biomechanical engineering, 131: 011008, 2009. Olgac U, Kurtcuoglu V, and Poulikakos D. Computational modeling of coupled blood-wall mass transport of LDL: effects of local wall shear stress. American Journal of Physiology-Heart and Circulatory Physiology, 294: H909-H919, 2008. Olgac U, Kayaalp AD, and Muradoglu M. Buoyancy-driven motion and breakup of viscous drops in constricted capillaries. International Journal of Multiphase Flow, 32: 1055-1071, 2006. Olgac U, Kurtcuoglu V. Reply to “Letter to the editor: ‘The plausibility of arterial-to-venous oxygen shunting in the kidney: it all depends on radial geometry'”. Am J Physiol Renal Physiol, 309(2): F181-182. (2015). Olgac U, Patient-Specific Modeling of Low-Density Lipoprotein Transport in Coronary Arteries. In: U. Demirci, A. Khademhosseini, R. Langer, J. Blander (Ed. ), Microfluidic Technologies for Human Health. Singapore, World Scientific, 2012. Olgac U*, Wiedemair W, Kurtcuoglu V. Dynamics of Renal Oxygen Transport: Three-dimensional Computational Whole Kidney Model, in 42nd Meeting of the International Society on Oxygen Transport to Tissue (ISOTT 2014), UCL, London, UK, 2014. Olgac U*, Kurtcuoglu V. Oxygenation of the renal cortex: Computational modeling and anatomical observations, in 45th Annual Meeting of the Swiss Society of Nephrology (SGN-SSN), Interlaken, Switzerland, 2013. Izbassarov D, Olgac U, Muradoglu M. A Front-Tracking Method for Computational Modeling of Viscoelastic Two-Phase Systems, in 8th Annual European Rheology Conference, Leuven, Belgium, 2013. Muradoglu M, Olgac U. Effects of Surfactant on the Motion of Large Bubbles in a Capillary Tube, in 64rd Annual Meeting of the American Physical Society (APS) Division of Fluid Dynamics, Baltimore, Maryland, USA, 2011. Olgac U*, Muradoglu M. Unsteady surfactant-laden liquid plug propagation: A model for surfactant replacement therapy, in ECCOMAS Thematic International Conference on Simulation and Modeling of Biological Flows (SIMBIO), Vrije Universiteit Brussel, Brussels, Belgium, 2011. Muradoglu M, Gursel G, Olgac U. Effects of surfactant on motion of a large bubble in a capillary tube, in EUROMECH Colloquium 521 – Biomedical Flows at Low Reynolds Numbers, ETH Zurich, Switzerland, 2011. Olgac U*, Muradoglu M. Unsteady surfactant-laden liquid plug propagation: A model for surfactant replacement therapy, in EUROMECH Colloquium 521 – Biomedical Flows at Low Reynolds Numbers, ETH Zurich, Switzerland, 2011. Gursel G, Olgac U, Muradoglu M. Effects of surfactant on the motion of a large bubble in a capillary tube, in 9th International Conference on Nanochannels, Microchannels, and Minichannels (ICNMM), University of Alberta, Edmonton, Canada, 2011. Muradoglu M, Olgac U, Gursel G. A Computational Study of Surfactant Effects in the Bretherton Problem, in 63rd Annual Meeting of the American Physical Society (APS) Division of Fluid Dynamics, Long Beach, California, USA, 2010. Olgac U*, Kurtcuoglu V, Saur SC, and Poulikakos D. Identification of atherosclerotic lesion-prone sites through patient-specific simulation of low-density lipoprotein accumulation, in 11th International Conference in Medical Image Computing and Computer Assisted Intervention (MICCAI), New York University, New York, USA, 2008. Olgac U*, Kurtcuoglu V, and Poulikakos D. Modeling of blood-wall low-density lipoprotein mass transport in dependence of shear stress, in 16th Congress of European Society of Biomechanics, Lucerne, Switzerland, 2008. Muradoglu M, Olgac U*, and Kayaalp AD. A finite-volume/front tracking method for computations of multiphase flows in complex geometries, in IUTAM Symposium on Computational Approaches to Multiphase Flows, Argonne National Laboratory, Illinois, USA, 2004. Thalmann P, Hieber SE, Schulz G, Deyhle H, Khimchenko A, Kurtcuoglu V, Olgac U, Marmaras A, Kuo W, Meyer EP, Beckmann F, Herzen J, Ehrbar S, Müller B. Three-dimensional registration of synchrotron radiation-based micro-computed tomography images with advanced laboratory micro-computed tomography data from murine kidney casts. Proc. SPIE 9212, Developments in X-Ray Tomography IX, 92120Y, 2014. Olgac U, Muradoglu M. Unsteady surfactant-laden liquid plug propagation: A model for surfactant replacement therapy. Proceedings of the ECCOMAS thematic international conference on simulation and modeling of biological flows, SIMBIO, 2011. Gursel G, Olgac U, Muradoglu M. Effects of surfactant on the motion of a large bubble in a capillary tube. Proceedings of the 9th International Conference on Nanochannels, Microchannels, and Minichannels, ICNMM, 2011. Olgac U, Kurtcuoglu V, Saur SC, and Poulikakos D. Identification of atherosclerotic lesion-prone sites through patient-specific simulation of low-density lipoprotein accumulation. Medical Image Computing and Computer-Assisted Intervention – Miccai 2008, Pt 2. Berlin: Springer-Verlag Berlin, 2008, p. 774-781. Olgac U, Kurtcuoglu V, and Poulikakos D. Modeling of blood-wall low-density lipoprotein mass transport in dependence of shear stress. Journal of Biomechanics 41: S277-S277, 2008. Muradoglu M, Olgac U, and Kayaalp AD. A finite-volume/front tracking method for computations of multiphase flows in complex geometries. In: Iutam Symposium on Computational Approaches to Multiphase Flow, edited by Balachandar S and Prosperetti A, 2004, p. 301-310. How do I find my peers?